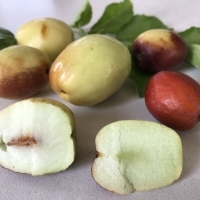 The Jujube is classed with the raisin, date and fig as a pectoral fruit and can be eaten fresh or dried. The fruit varies in size depending on the cultivar with a thin, edible, dark red skin surrounding a crisp white flesh. At the centre of the flesh is a small seed (pip). 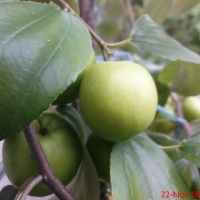 The fruit has a pleasant sweet taste and the texture and flavour resembles more an apple/pear than a date. They can be processed in various ways such as fresh, dried, candy, jam, pulp and wine. 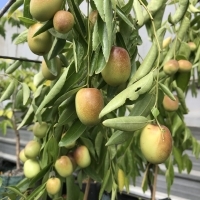 Jujubes are extremely hardy and tolerate saline soils which make it a highly adaptable crop well suited to a range of climatic condition. Produces large, round to barrel shaped fruit of very good quality. Sihong’s sweetness makes it great for fresh eating or dehydrating. Unlike other jujubes, when dried, Sihong has fine wrinkles on its skin surface. Very reliable bearing. Cross pollinate for best results. Large fruit is oval or pear-shaped and turn deep red when fully ripe. This is an excellent variety for drying but also tastes great when eaten fresh. Cross pollinate for best results. Fruit is round but flattened on the bottom and look similar to a small apple. Pick when the whole fruit (or at least 80%) has just turned brownish red. Texture is crisp and light we consider it an excellent fresh or dried variety. Fruit size 35-45mm. Developed at the Chico institute in California, this is an early fruiting variety. (Jan - March) Cross pollinate for best results. 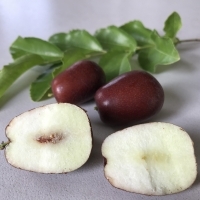 The Sherwood jujube is considered to be one of the largest and best flavored jujubes, with fruit growing the size of lemons. The Sherwood is a thornless jujube tree producing very dense growth with a columnar, upright tree shape. Late season variety. Cross pollinate for best results.